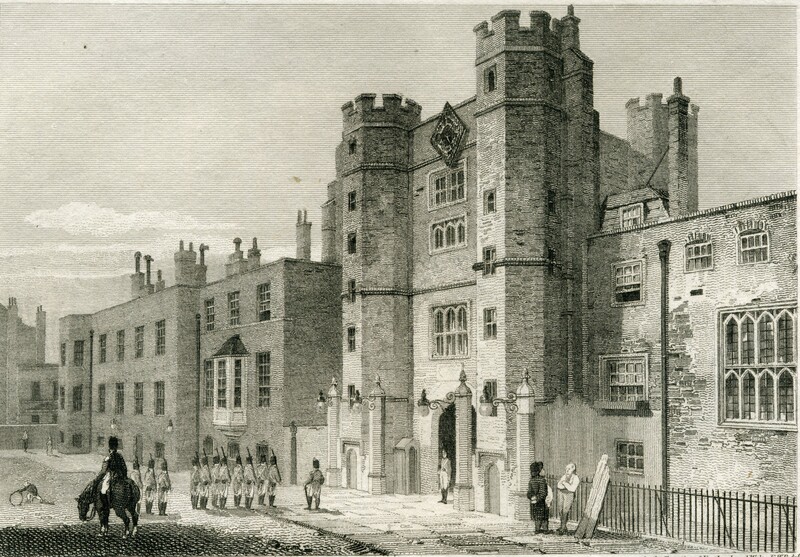 George III moved to St James’s Palace on his accession in 1760 and was married there the next year. The ramshackle old palace did not suit the couple and in 1762, the year that Prince George (later to be Prince Regent and George IV) was born, George bought Buckingham House on the other side of St James’s Park. The newly-weds moved there, renamed it the Queen’s House, and used St James’s Palace for state occasions, which included the births of the royal children. The King held Levées in the afternoon on Wednesdays and Fridays, and on Mondays when Parliament was sitting. These were men-only occasions and formal Court dress or, for officers, dress uniform was worn. Male members of the royal family, ministers and ambassadors were expected to attend and MPs who supported the government of the day often came too. They would line the walls of the Privy Chamber (for those of the highest office) and the Presence Chamber and the King would circulate around the room before retiring to the King’s Closet and holding a Privy Council. Drawing Rooms were held on Thursday afternoons and on Sundays after the morning service at the Chapel Royal. (Today this is the only part of the palace open to the public. Services are at 8.30 am and 11.30am, October to Good Friday.) 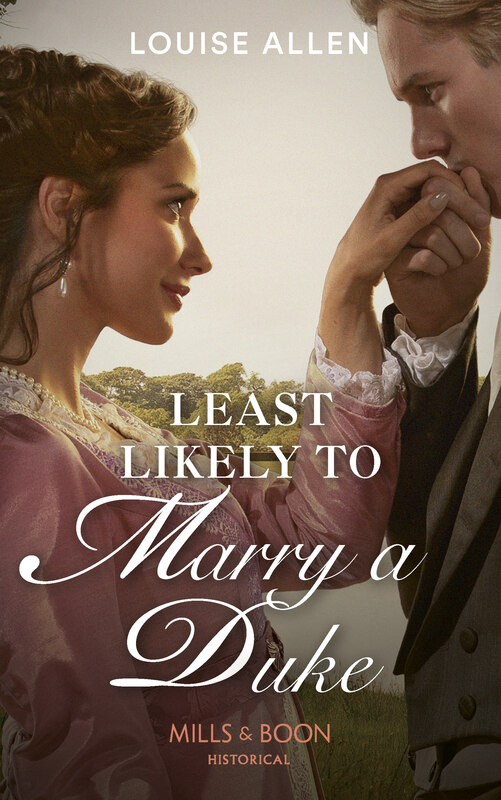 Men and women were admitted: this was the opportunity for newcomers to Society to be presented and courtiers intending to marry would present their spouses. Drawing Rooms were also the occasion when new ambassadors were received, newly appointed senior officers and ministers would come to ‘kiss hands’ and decorations would be bestowed.Full court dress was worn, which for women meant vast hooped skirts, even when the fashion was for a high waistline, creating a ludicrous silhouette. 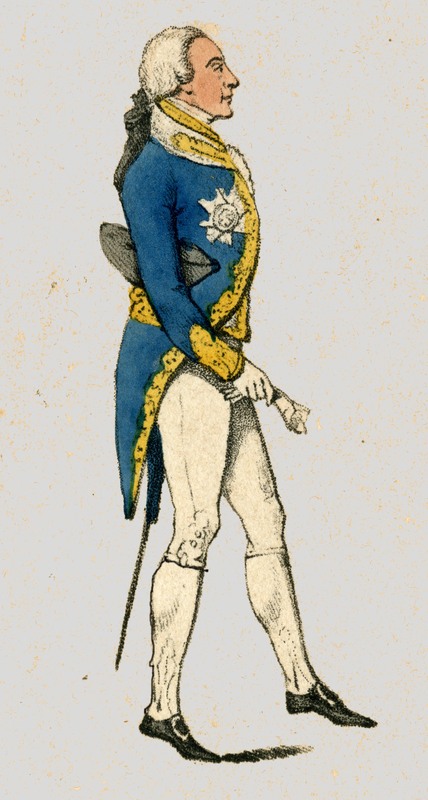 When George VI came to the throne he allowed hoops to be dispensed with, but ostrich plumes continued to be compulsory. Jane Austen’s cousin, Eliza de Feuillide, attended a Drawing Room in her youth, before she was widowed and remarried Jane’s brother Henry. She complained bitterly about the great weight of the gown. After the formal business was over the royals would work around the room speaking to the guests and later Queen Victoria recalled learning the art of ‘cercléing’. After 1788, with the onset of the King’s illness, Levées and Drawing Rooms were held only intermittently at St James. In 1810 John Wallis noted, ‘…since [George III’s] last illness, this palace is almost deserted; a levee only is holden here now and then when the king comes from Windsor, for that purpose. Windsor is now the favourite residence.’ From then on one of the royal princes would preside or, for Drawing Rooms, the Queen. On the King’s 72nd birthday in 1810 there were great celebrations on June 4th, featured in detail in all the papers. The Morning Chronicle reports that the royal family visited The Queen’s Palace in the morning but the King remained there in the afternoon while the Queen and her family processed to St James’s Palace. They were not only without the King, but also the Duke of Cumberland who was recovering from a murderous sword attack by his valet which left him badly cut around the head (or, as gossip persisted in stating, he had murdered the valet and had been wounded during the fight!) and Princess Amelia who had been in poor health for some time. 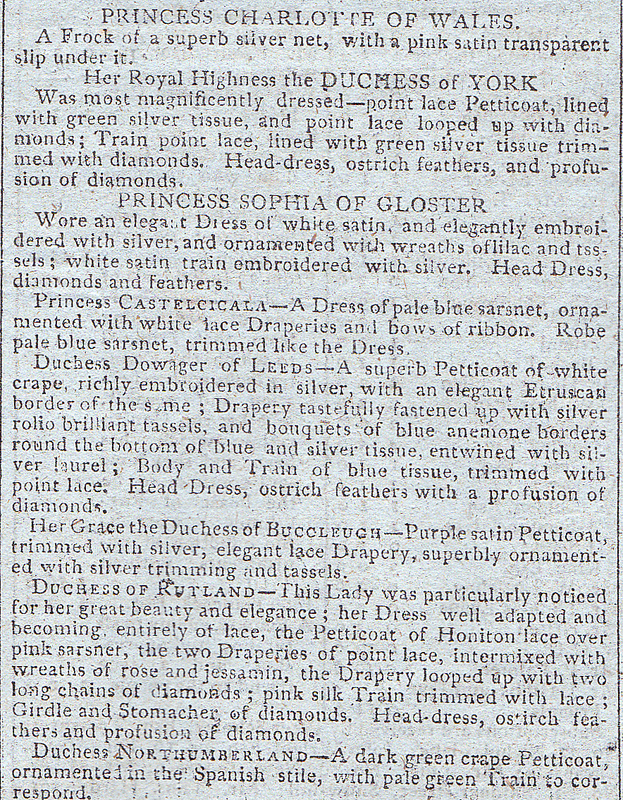 The paper hints that many ladies had held off from ordering court dress in case they needed to change it for mourning. Princess Elizabeth was in tears throughout, although whether from worry about her siblings, or distress that her father could not attend, is not clear. The Morning Chronicle devoted two full pages to describing the Drawing Room, the balls and illuminations in the evening and five and a half columns to details of the gowns worn by the ladies. Although their parents were living at the Queen’s House (or perhaps because of that!) the royal dukes moved into apartments at St James’s Palace with, of course, the exception of the Prince Regent who had Carlton House built for himself. When he succeeded to the throne he redeveloped The Queen’s House to become Buckingham Palace, with State Apartments that removed the necessity to use St James’s. The old palace became the home of other royals, retired courtiers and palace officials, a role it continues to fulfil as London home to the late Queen Mother, and the Duke and Duchess of Cambridge. One building we can be certain would be completely recognisable to Jane Austen in today’s London is St James’s Palace which lies at the bottom of St James’s Street with Green Park to the north-west and St James’s Park to the south. It had an unglamorous beginning for a royal palace – as a leper hospital. In the 11th century the parish of St Margaret’s, Westminster (whose church sits in the grounds of Westminster Abbey) was given land for the establishment of a hospital for fourteen leprous women. The hospital was dedicated to St James the Less and was remote from habitation in a swampy area, regularly flooded by a branch of Tyburn Brook. What is now Piccadilly was a track on a ridge leading from the City of London to the west, but it was completely without habitation. Successive kings and queens granted the hospital money until 1348 when the Black Death seems to have killed off the inhabitants and the buildings were leased out to various occupiers until 1439 when Henry VI granted the hospital and its lands to Eton College. In 1531 Henry VIII took it from the College in a swap with some royal lands elsewhere. In the City of London and the City of Westminster Henry already possessed the Tower of London, Bridewell Palace, Baynards Castle, Whitehall Palace and Westminster Palace. He had another palace just downstream at Greenwich, plus Hampton Court upstream which he seized from Cardinal Wolsey. Despite all this he decided to build another palace at St James’s and had the old building demolished to make way for it. By acquiring the St James’s property he vastly extended his Westminster/Whitehall lands with a hunting park over a wide area, including what is now St James’s Park.The new palace was begun in 1536 and the great gatehouse that stands at the foot of St James’s Street dates from this phase of building. (Photograph at the top of the page). 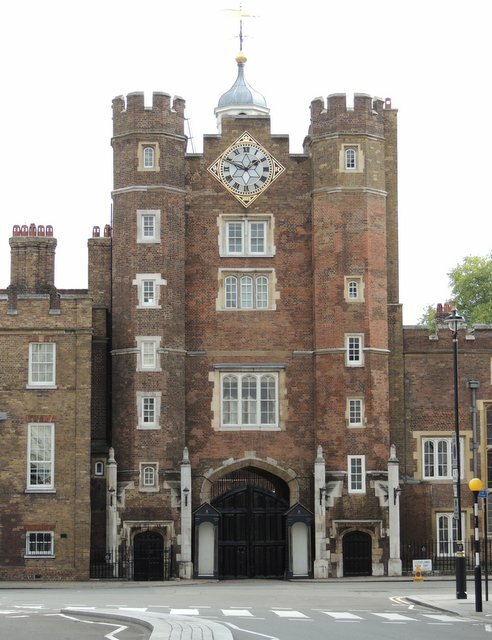 Edward VI, Mary and Elizabeth all lived at St James’s Palace from time to time and, with the accession of the Stuart dynasty, more work was done to make it a fit residence for the heir. Prince Henry, however, died in 1612, after which it was taken over by his brother, later Charles I. The palace was still remote, with parkland to the south and fields to the north. The only significant development was the Queen’s Chapel, built by Inigo Jones in anticipation of Charles’s marriage to Henrietta Maria, a Roman Catholic who lived at the palace whilst Charles had his base at Whitehall. During the Commonwealth the palace became a barracks and a prison, but after the Restoration the Duke of York (later James II) used it and considerable building work was carried out. James moved to Whitehall on his accession leaving St James’s to his queen. It was during this period that the palace’s first water closet, ‘The Stool Room’, was built complete with Dutch wall tiles and brass and ivory fittings to operate the flushing cistern.In the years after Charles II’s return to the throne the entire St James’s area was developed and became a major centre for courtiers, hangers-on at the court and the tradesmen who serviced them. After the Glorious Revolution William and Mary did not live at St James’s but Mary’s sister, Queen Anne, did, and had an extensive building programme carried out with a new suite of royal apartments designed by Sir Christopher Wren. The queen held ‘Drawing Rooms’ during the winter months when anyone of respectable appearance would be admitted, along with the courtiers and ministers there to do business, but they were dull occasions and the queen disliked the palace, preferring Windsor Castle or William and Mary’s Kensington Palace.When the Hanoverian monarchs took over the throne in 1714 George I moved into St James’s Palace and used it more intensively than his predecessors. George II disagreed, apparently concurring with the Prussian Baron Bielfeld who called it ‘crazy, smoky and dirty’ and Daniel Defoe who considered it ‘mean’ and beneath the dignity of the court.But it was the official London royal palace – Westminster and Whitehall had become Parliamentary and governmental complexes and the Tower was impossibly medieval. Winter was the time for the court to be in residence there with monarchs preferring Kew, Windsor and Kensington during the summer months. Prince George, who was to become the Regent, then George IV, was born at St James’s Palace in 1762 and the baby was displayed less than two weeks after his birth to all those attending the Drawing Room. The king and queen considered the palace, described by Sir John Fielding as ‘the jest of foreigners’, to be a ‘dust trap’, so they lived at the Queen’s House (later to become BuckinghamPalace). However that had no state rooms, so the Court was still officially at St James’s – where it remains to this day. All ambassadors are still accredited to The Court of St James’s. I will visit the Court of St James under George III and George IV, as Regent and king, in my next post.